Last year, Glenn Neigenfind introduced me to the dirt roads and trails west of US Hwy 550, bounded on the north by Kinikin Road (Montrose, Colorado) and on the south by Buckhorn Road. What a great place to explore! On April 13th, I had a fair amount of time to ride, so I poked around some more, following some of the roads all the way to locked gates. The GPS track below shows the area. I followed several roads to locked gates, then went puttering up Lower Power Line Road. The scale is provided by the yellow/black dotted line. The line is one mile long. Access is via Buckhorn Road, which heads east from US Hwy 550 not a hundred yards north of the gas station in Colona. Note the right hand arrow from the Buckhorn Road callout—it points at Buckhorn Road. To access the dirt area, keep going straight past Buckhorn, through a gate, and you’re there. I’ve never seen the gate closed, even though a sign indicates it should be. The rule around here is to leave gates the way you find them. The road marked “Upper Power Line Road” follows the ridge, generally under the big electric high-tension pylons. The views are fabulous. The road is relatively easy with only tiny amounts of scree, though steep in places. The road ends in the locked gate as shown. The map also shows the southern part of the Lower Power Line Road, which follows some large wood (double-poled) high tension lines. I took a slight side track at one point. This is absolutely one of my favorite areas to ride. It’s very near home, so makes a good after-work ride. 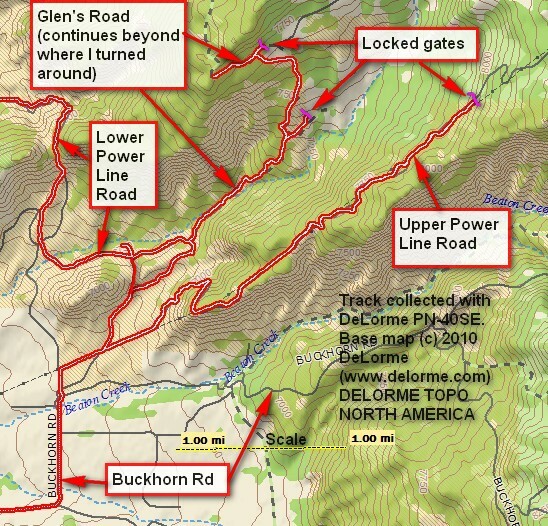 This entry was posted in GPS Tracks, Montrose County, Motorcycling and tagged Colorado, DeLorme Topo North America, dirt bikes, glenn's road, montrose county, motorcycling. Bookmark the permalink.